This is part 3 to our 5 Part Series on Empathy and its relation to artificial intelligence, machine learning, and where we are headed in the future with technology. Follow the Kairos team as we explore empathy in the tech field and ways to implement it. In our last blog post related to this series, Empathy in Artificial Intelligence (AI), we talked about empathetic AI increasing the job market now and in the future. We’ve also explained, in part 1 of our series, the importance of AI in our lives, as well as in machines. In part 3 we will look at some companies that have not only recognized Empathy in AI’s importance but who also have started to implement it into their machines. Empathy is something humans learn as infants so it is not so simple to teach to a machine. Research and discoveries on empathetic AI is constantly changing as are the methods to teach AI empathy. At Kairos we believe the most affective way is through facial recognition and emotion analysis yet there may be additional ways through keywords, neural networks, and wearable tech as others have explored. Sometimes a bad day turns into a bad couple of months and when it feels like the world is caving in on you, you need to reach out to someone. Friends, family, and even phone hotlines become confidants, and now so is AI. Koko bot is an anonymous community of supportive people, in more than 150 countries, that talk to one another through chat platforms when people are experiencing depression, stress, and/or just need some advice. The chats must be monitored, and have been by humans, to help recognize mental health emergencies. Koko bot still uses human moderators but 90% is moderated by a smart AI that responds with empathetic statements, and facts, to specific keywords. According to a study done by MIT and Northwestern University, 166 people who had symptoms of depression found the Koko Bot to be helpful. Larger companies are taking notice. Facebook Messenger, Kik, Telegram all use Koko bot and Crisis Text Line is next. Crisis Text Line primarily is for teenagers who, when growing up, feel stress in a lot of situations. “...Integrating services like Koko’s directly into our platform helps ensure our users have access to the emotional support they need, when they need it,” said Kik CEO Ted Livingston. When prompted, through keywords, Koko shows the user resources, like Crisis Text line are available for them to use. Read Part 1 & 2 of our Empathy in AI Series. Meet Ellie, the University of Southern California Institute for Creative Technologies (ICT)’s AI like-minded counselor. Ellie has been learning from humans since the late 90’s and in the last few years the program, Ellie, has created human connections through interview interactions. Ellie is the shining star of the ICT’s DARPA SimSensi project: AI virtual agents that interact with humans through high level artificial emotional intelligence. Ellie is a virtual therapist who has discussions primarily with disengaged military personnel. These people may be suffering from post-traumatic stress disorder, or other affects of war, so it is important that Ellie exercises empathy. In a way, Ellie does this. During face-to-face private interviews, Ellie listens with webcam eyes and microphone ears. Using Microsoft Kinect, Ellie tracks faces with facial recognition, head poses, body gestures and vocal parameters to listen and determine if the user has symptoms of psychological distress. Ellie has very casual conversations with humans and knows how to ask follow-up questions, nod, and grimace at appropriate times to reveal empathy. Ellie is so convincing that when ICT conducted a trial study, telling one group of humans that Ellie was controlled by humans and the other group that Ellie was fully computerized, the group that knew Ellie was fully computerized told Ellie more personal details about their PTSD and distress than the first group. The results proved that when machines can understand empathy, humans feel more comfortable talking to the machine as they do not feel judged and feel more free to be honest. When speaking with a human you may feel embarrassed, pressured, or even at risk and with an empathetic machine those feelings seem to disappear. Even better, at the end of a conversation Ellie uses conversational and behavioural data to identify PTSD or stress symptoms instead of human biases. For some people robots have become new friends for them to talk to, work with, and in some cases date. It’s not a far fetched idea, I mean how many of us fell in love with R2-D2, C-P30 and newcomer BB-8 and daydreamed for a second about a robot bestie? Some researchers didn’t just daydream, they went as far as to create their robot friends. Nao and Kasper are two child-like companion robots who have been built to understand empathy and mimic it back to humans. Both AI machines are being taught empathy by modeling the first few years of a human's life, communicating through non-verbals and emotion. Without speech these machines rely on cameras and audio features to learn human queues, and respond back with robotic facial expressions, body posture, and child-like games. Noa is the most impressive of the two. Noa will hunch it's robotic shoulders and look down to emit sadness, hug or raise robotic arms to show happiness, yet more impressive is that the more time Noa spends with a person the stronger the bond between Noa and that person is. You don’t even need to tell Noa how you are feeling, Noa will understand from your smile or frown on your face and will act accordingly. 58 cm in height, NAO is Softbank's first humanoid robot. He has continually been evolving since the beginning of his adventure in 2006. Image credit: Softbank Robotics. Noa also uses a neural network as it’s brain to remember specific people and the interactions with those people. Nao can also explore the environment, look where you are looking, and although Noa’s emotions are programmed, Noa decides when to display specific emotions and to whom. 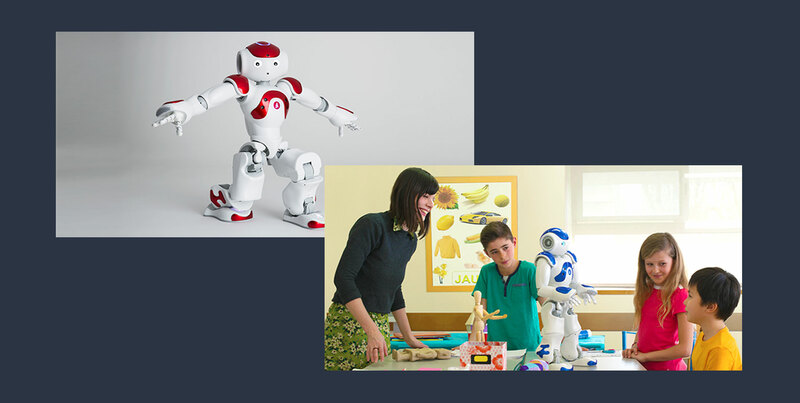 The purpose of Noa, Kasper, and other robots like them, is to create a companion for children and elderly who may have disorders, illnesses, or need someone there to help them. In the long run the European team of creators hopes to have their robots befriend humans who have anxiety issues and help them through it so they can live a more successful social life. These are just a few, of the very impressive, companies that have started to figure out possible ways to teach AI programs empathy and other emotions. There are many more companies out there researching, developing, and implementing empathy into their AI and Team Kairos is humbled to be part of that process. As you have read, empathy being added into AI creates a program that better serves humans and better interacts with us which in the long run benefits our society. It is an exciting and innovative time to be part of the continuous growth of AI and we can't wait to see what comes next. Cole is the CTO at Kairos, a Human Analytics startup that radically changes how companies understand people. He loves all things cloud and making great products come to life.